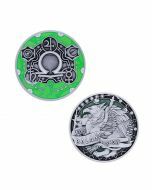 Scorpio is the third geocoin in our Zodiac series. The dates for Scorpio are October 23rd to November 21st. Scorpio is one of the oldest constellations ever recorded. Ancient Sumerians referred to "Gir-Tab" (the scorpion) some 5,000 years ago and long before the first appearances of a divided zodiacal calendar in the Babylonian astronomy of the 1st Millennium B.C. Gir-Tab, "the sting that burns" is a complicated constellation made of 18 primary stars and located near the center of the Milky Way. Ancient mythology records that Scorpius was sent forth to destroy Orion after he boasted that he would hunt down and kill every animal on earth. Artemis, also a hunter, wasn't having it and sent her scorpion to challenge and ultimately defeat Orion. In the aftermath, the Gods raised up both Scorpius and Orion to the heavens where Orion continuously flees away from the scorpion across the night sky. On the face side we see Scorpius treading over the fallen symbol of Orion and supported by the moon and antlers symbols of Artemis. There are 18 stars along with the water symbol of Scorpio that bracket our hero over the Orange Beryl color of the old zodiac stones of Aaron's breastplate as described in the Book of Exodus. 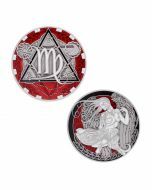 On the reverse the symbol of Scorpio is center in the Triplicity with the Day Ruler Venus to the left, Night Ruler Mars to the right and Participant Ruler Luna overhead and constellation arrangement below. The whole is surrounded by the ancient Greek water-border, as Scorpio is one of the three water symbols.